Leading Manufacturer of aquamarine stone, quartz stone, rose cut gemstone, uncut gemstone, mercury topaz and cabochon stone from Jaipur. We are a recognized manufacturer, exporter, importer and supplier of beautifully designed Fluorite Cabochon. Our fluorite cabochons are processed by our talented professionals in accordance with predefined industrial norms using latest technology. 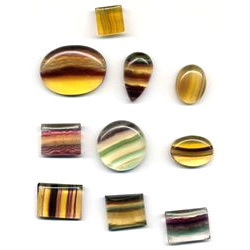 In addition, offered fluorite cabochons are quality tested on several parameters by quality controllers in order to supply a defect free range to customers. We are giving these fluorite cabochons on numerous customized options so as to meet the needs of clients. Looking for Fluorite Cabochon ?